Sometimes we come across puzzles for which we think that something wrong with the statement of puzzle. We think that there is no answer to the given puzzle. However if we think out of box or laterally then we can come with the solution of the puzzle quickly. 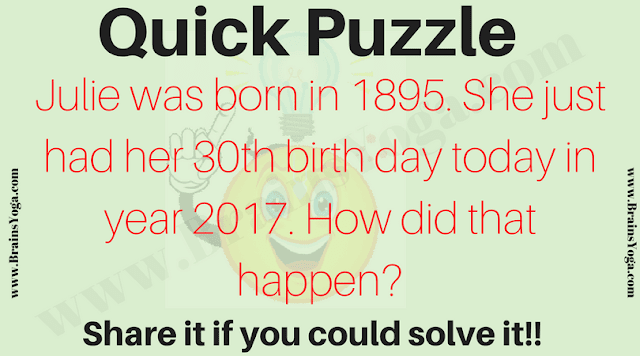 Here is one such puzzle which will look impossible to solve at first reading, but if one thinks out of box, this is very easy puzzle. So can you think out of box and answer this puzzle as quickly as possible? Can you solve this puzzle quickly? Julie was born in Room No. 1895.